Delivers 30 Highway MPG and 19 City MPG! This Chevrolet Camaro delivers a Gas V6 3.6L/217 engine powering this Automatic transmission. WHEELS, 18" (45.7 CM) PAINTED ALUMINUM (STD), WHEEL AND TIRE, SPARE, COMPACT includes 18" (45.7 cm) steel spare wheel, TRANSMISSION, 6-SPEED AUTOMATIC includes TAPshift manual shift controls on steering wheel (STD). SEATS, FRONT SPORT BUCKET includes adjustable head restraints and folding rear seat with trunk pass-through (STD), LICENSE PLATE BRACKET, FRONT, GRAY, LS CLOTH SEAT TRIM, ENGINE, 3.6L SIDI DOHC V6 VVT (323 hp [240.8 kW] @ 6800 rpm, 278 lb-ft of torque [375.3 N-m] @ 4800 rpm) (STD), BLUE VELVET METALLIC, AUDIO SYSTEM, AM/FM STEREO WITH CD PLAYER MP3 playback capability, music navigator, Graphic Information Display (GID) and auxiliary input jack, includes outside temperature display (STD), 2LS PREFERRED EQUIPMENT GROUP includes Standard Equipment, Wipers, front intermittent, Windows, power with driver and passenger Express-Down/Up, Wheels, 18" (45.7 cm) painted aluminum. 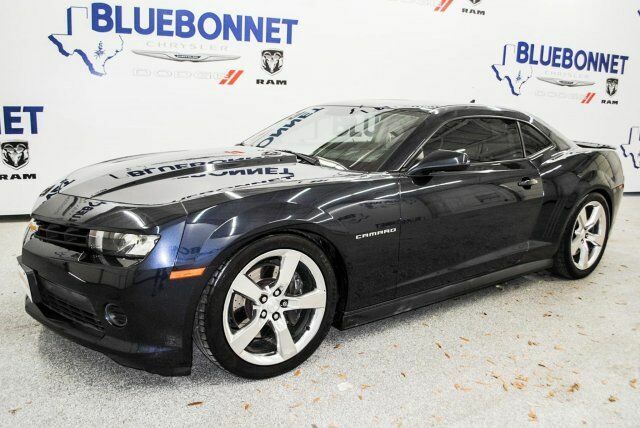 For a must-own Chevrolet Camaro come see us at Bluebonnet Certified, 3566 South IH 35, New Braunfels, TX 78132. Just minutes away!